Dogue de Bordeaux Rescue Australia 2019 Calendar is available for purchase now! Congratulations to Club members Moloscyg on gaining the final points towards Moloscyg Samantha's Australian Champion Title. Our club members achieved some outstanding show results over the last weekend of July. Congratulations to the girls breeders and handlers. All lovely young ladies with big futures ahead of them. Several club members are making their dogs available for a study into SAS in the breed. This is an important study to work towards reducing Heart Conditions within the breed. Details of the study below. 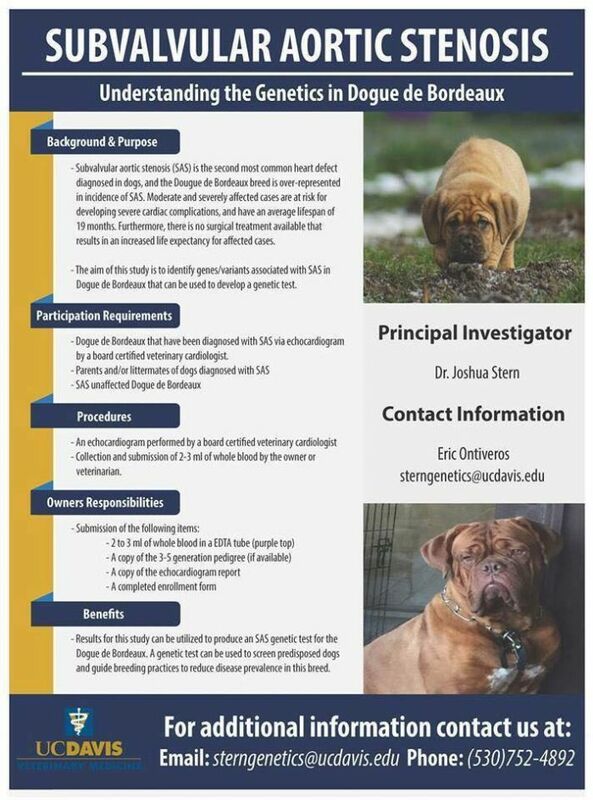 The Dogue de Bordeaux Society of America in collaboration with Dr. Joshua A. Stern, DVM, PhD, DACVIM (cardiology) at the University of California, Davis School of Veterinary Medicine, would like to request your assistance in a research study to determine the genetics behind subvalvular aortic stenosis (SAS). Dr. Stern is a board-certified veterinary cardiologist and his laboratory focuses on the identification of genetic variants associated with inherited and acquired heart disease. SAS is one of the most common inherited heart conditions reported in the DDB breed. It is characterized by a ridge or ring of fibrous tissue located below the aortic valve resulting in an increase in aortic outflow velocity (AoV). Mildly affected dogs may have a normal lifespan, but moderate to severely affected dogs are at risk for developing severe cardiac complications and have an average lifespan of 19 months. To date there is no medical intervention available to significantly expand the lifespan of affected dogs, highlighting the need of a genetic study to help reduce the prevalence of SAS in the DDB breed. For this study, we are currently enrolling both SAS affected and unaffected DDB, with the goal of attaining a sample cohort to conduct a comprehensive genetic study. Club Members - Moloscyg Kennels - Visited Europe to attend the 2017 club match. Congratulations to Taureauxroug & Amadange Kennels - Amadange Fire in the Sky (Oona) gained her AUSTRALIAN CHAMPION title in style, being awarded BOB, Best Intermediate in Group 6 & then BEST INTERMEDIATE IN SHOW at one of WA's largest All Breed shows on the calendar, The Western Classic on 4/3/2017. This win was made all the more special because it was under breed enthusiast Senor Rafael Alcrudo. Oona received some lovely comments from the judge. Welcome new members: Two new kennel members from Western Australia - Jarred and Brooke from Taureauxroug and Amanda from Beavaisrogue . April was a massive month for two club members at the two biggest shows this year in the Dogue calendar !! Congratulations for Natasha Smith from Bronzantiq in Queensland for her female Ataraxia Clarissa (Clara) winning Best of Breed at the 2011 Sydney Royal Dog Show. Photos of both winners will follow shortly. Welcome new members: Joanne from Roguedogue in NSW. New page added for Bas Bosch's visit. Dogue de Bordeaux feature show Saturday 2nd April 2011 Castle Hill, Sydney. Molosser Seminar Sunday 3rd April 2011, Erskine Park, Sydney. Online Bookings and Payments now available for Bas Bosch events in Sydney. See Bas Bosch page. HUGE NEWS !! The Dogueclub can confirm the we have secured breed specialist, Mr Bas Bosch from the Netherlands, to judge our first breed feature in Sydney in early 2011. Further details will be announced soon along with a molosser breed lecture the day following the show. An exciting weekend on the 24th and 25th of September with the French Clubmatch. Attended by 4 members kennels, Amedange, Ataraxia, Bellarouge and Bronzantiq, who were able to witness Tyrannus Skyejacked at Emberez win Best in Show. Club members recently presented a breed lecture to an enthusiastic group of trainee judges in New South Wales. Thank you to the Group 6 Co-ordinator for the opportunity to attend. Welcome to new member Ange McKenzie of Dogueridge Kennel in New Zealand. Club members presented a breed lecture to trainee judges in Queensland and took a number of Dogues to enable the trainee judges to gain some hands on experience of the breed. Thank you to the Group 6 Co-ordinators for the opportunity to attend. Baithin and Bronzantiq Kennels have jointly announced the impending arrival of Ecstacy de la Tour Gelee (Imp Frn). Ecstacy is sired by Drug Dealer de la Tour Gelee out of Int. Ch. Vanchette de la Tour Gelee. Her pedigree has a double cross to Sodium and includes Int. Ch. Balrog de la Tour Gelee. Ecstacy is the first import to Australia from the de la Tour Gelee Kennel in France. Amedange has announced the arrival in Australia of "Jerivindi Shala (Imp UK)". Shala is sired by US/Dutch Youth Ch. Rhodonite Rolex Emberez". Rolex is the Best of Breed winner at Westminster 2010 and was America's No. 1 DDB in 2008. Shala's dam is "Jerivindi Talullah Belle", a Felson x Diva daughter and litter sister to "Int/Ir Ch. Jerivindi Juno". Shala is the first import in to Australia from the Jerivindi Kennel in the UK. Surveiller has announced the impending arrival of "Ien van't Bulscampvelt (Imp Blg)". Viski is sired by "Hurluberlu van't Bulscampvelt" out of "Gironde van't Bulscampvelt". Viski is linebred to "Chivas van't Bulscampvelt" and his grandsire "Multi Ch. Rano de L'Aube Rouge". Viski is the first import to Australia from the van't Bulscampvelt Kennel in Belgium. Amedange has announced the impending arrival of "Camelots Chunky Cherub (Imp USA)". Cali is sired by "Int/Nor/Swe/Dan Ch Ti Amo de Dame Midnight" out of "US Ch Artemis des Gladiateurs de Guesny." Cali is both a Signore Kwan and Simon Kwan grand-daughter. We believe this is the only litter in the world combining both Signore Kwan and Simon Kwan in the pedigree. Bronzantiq has announced the impending arrival of "Espion des Gladiateurs du Guesny (Imp Frn)". Espion is sired by "Commadore des Gladiateurs du Guesny" out of "Brooke des Gladiateurs du Guesny" Espion is a Simon Kwan and Brandoux Toezzz great grandson. Surveiller has announced the impending arrival of three imports. The first is "Thorr z'Orisku (Imp Czech Rep)". Eazy is sired by "Multi BISS/Multi Ch Cejte van't Bulscampvelt" out of "Heimers Falanghina De Broncha". Eazy is a Brando Dospilos grandson and a Brandoux Toezzz great grandson. Their second and third imports are litter brother and sister, "Ultimat z'Orisku (Imp Czech Rep)" and "Upsy z'Orisku (Imp Czech Rep)". They are sired by "Multi BISS/Multi Ch Moby De Legeane" out of "Chiara du Ruisseau de la Noue". The addition of these new imports will provide the opportunity to expand the gene pool in Australia with some much needed quality bloodlines. Mastiffs Breed Lecture presented by Bas Bosch, Sunday 22nd November, 2009, Auckland Exhibition Centre, New Zealand. Four of our Members attended the event, Chris and Yvette Girling, Leanne Miller and Vicki McArthur, as well as other Australians and devoted DDB lovers Nellie Abela and Julie McCabe. METZ International All Breeds Show - held on Saturday 12th September, 2009. The Special Guest judges of the Dogue de Bordeaux for the event were Chris and Yvette Girling. The Show was also attended by Leanne Miller, Vicki McArthur and Julie McCabe, as well as Nellie Abela who also was Guest judge for other breeds on the day. A wonderful weekend and educational holiday for everyone who attended! "Tyrannus Skyjacked by Emberez" - Best in Show, SADB National D'elevage.